I usually make a ton of cranberry sauce for Thanksgiving, and no matter what I tell myself each year, I always make far more than I need. So, I freeze the leftovers for later use. This year, I totally forgot about the leftovers in the freezer until I had to clean it out to make room for our beef order. I was happily surprised when I found a couple of bags of this deliciousness. So, I decided to make some cranberry sauce bars. Preheat oven to 350 degrees. In a large bowl, combine the first 5 ingredients: flour, oatmeal, brown sugar, baking powder, and melted butter, until crumbly (large crumbs). Reserve 1 cup of the crumb mixture. Press the remainder into an ungreased 8 or 9 inch square pan. Spoon and spread the cranberry sauce over the crumb mixture. Sprinkle with the reserved crumbs and gently pat. These are so simple and look delicious. I can’t wait to try your recipe! 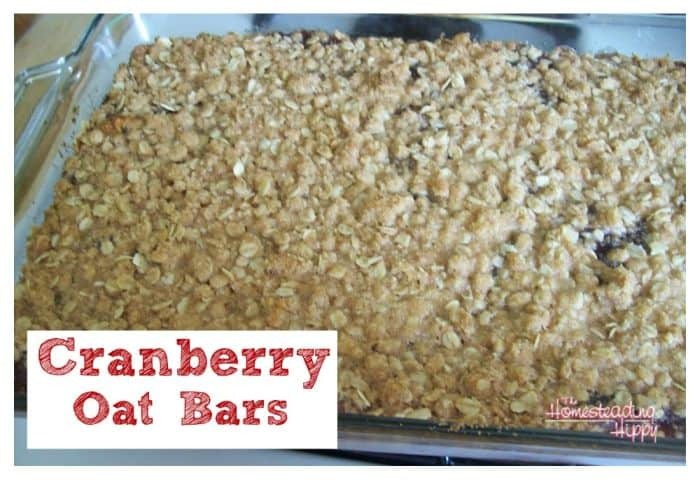 Interesting looking recipe… I’m not much on cranberry but I know someone who loves them. I will share this with them! Thank you! This looks fabulous and a great use of cranberry sauce! Those look delish! I love the idea of putting an oat topping on the cranberry sauce – I’m not a fan of sauce plain.